For those of you wanting to read (海宴) Hai Yan’s Nirvana in Fire novel in English, we have another chapter translated for you. Here is the link to Chapter 7 (and the preceding chapters as well) if you want to get caught up! The chapter notes, marked as footnotes, give a little more context and some cultural information. From Fu Zhou, they traveled for ten or so days via the main waterway of the River Fen till they docked at Ling Gorge. From there it took another ten days or so, over land passing through Hui Zhou, before the walls of Jin Ling came into sight. On the way, all of Mei Changsu’s time was basically split between the two brothers; while on the boat, all of his time was spent with Xiao Jingrui, giving him advice on his martial arts and pointers on handling challenges, eventually moving on to the strategies and the art of war. 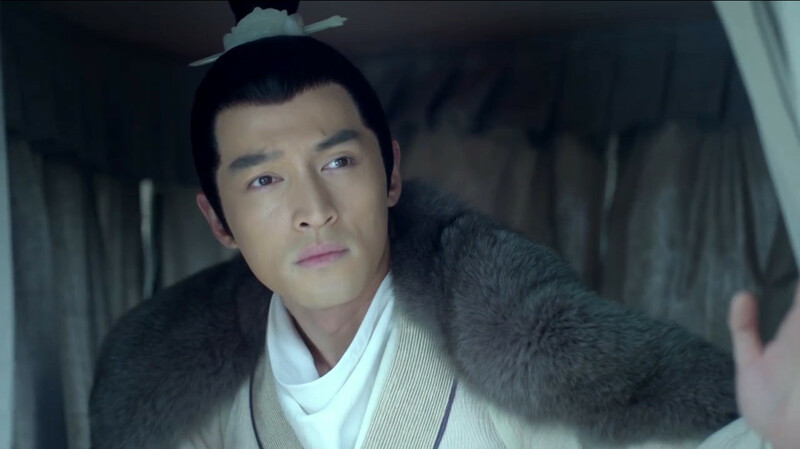 After they moved to land, all of his time was spent with Xie Bi, who sought advice on economics and politics. Mei Changsu was always occupied and barely ever had a moment of free time. So it was not until the smokey willow trees of the capital appeared before their eyes, did the three realize that the long and distant journey had come to an end – it had felt so short and indolent. The two brothers continued to bicker, but Mei Changsu was not listening. He had his head raised, his gaze focused on the towering and unyielding main entrance of Jin Ling city. On his motionless face, you could not see even a ripple of emotion; the only movements were from his dark hair, tossed in the wind. A few wisps fell on his pallid cheeks giving him an air of profound sadness brought about by the vicissitudes of life. As he spoke of old Master Li, a great Confucian scholar of the previous generation, Xiao Jingrui and Xie Bi could not help but look on with respect. Even when this great master had accepted a summons to enter the Court to teach the many Princes, he had never forgotten to set up lecterns outside the Palace walls. Of those who received his teachings, there were the noble and rich, the common and poor. He treated them with no difference, so for a time, no man could equal his good name. However, that year, he angered the Emperor for an unknown reason, and was relegated from his status as Imperial Tutor to a commoner. He left in resentful rage and died disheartened; his death was a great loss to all the scholars in the world. Mei Changsu’s depth and breadth of knowledge was unfathomable, and though the brothers both knew that he must be of great origins, they had not imagined that he had been taught by the honored scholar. Xiao Jingrui carefully examined his expression for a while before being reassured. He fixed the saddle on his horse, leading the way along the road and the three of them entered the city one after the other. It was close to dusk, the day market had closed and the night market was yet to open; the street was empty and rather peaceful. When they reached the Marquis of Ning’s prefecture, the servants were busy hanging up the lanterns. “Aiya, quickly go and notify everyone that the eldest and second young master have returned!” An attentive footman cried loudly upon noticing them, before coming up to greet them. Xiao Jingrui dismounted from his horse, and seeing that Mei Changsu looked rather tired, he quickly helped him off his horse, and instructed the servants, saying, “Send someone to clean up ‘Snow Cottage’1 immediately. All amenities should be replaced anew”. Mei Changsu smiled faintly, didn’t decline, and instead followed him into the main entrance of the Marquis’ Prefecture. Just inside they came face to face with a screen-wall2 on which the words, written personally by the Emperor, “A Pillar of the Nation’s Defense”, were carved. “Uncle Qin, are Uncle Zhuo and his family still here?” Xie Bi followed them in and asked an old servant who had come to receive them. As soon as his little brother had finished his queries about their parents and relatives, Xiao Jingrui immediately interposed and ask: “Do you know if young master Yan has returned?”, after all, he did worry about him very much. With serene smiles, the two brothers, one at each side accompanied him through the second entrance gate. Along the way any servant who saw them understood with one glance that this person was an honored guest. However with his white robes, his clear and plain face they could not guess what his background was. They could only tell that the cold and handsome young man behind him was definitely not ordinary; his disposition was inexorably severe, even a glance would cause a feeling of penetrating coldness. According to customs in noble households, unless receiving an Imperial edict or people of a higher rank, the central gate was usually not opened and none were received in the main hall. Hence, the brothers directly lead their guest to the east hall. While it was still light outside from the glow of the setting sun, inside, the hall was lit by many bright candles. Mei Changsu signaled Fei Liu to stop, and took half a step back himself before following the brothers through the door. Below the warm yellow light, a person, with a scroll held in one hand, was pacing across the mirror smooth marble floor, seemingly deep in thought. Upon hearing the sound of people entering, he stopped and turned, his long beard swaying even though there was no wind. This was the one whom the Emperor relied heavily upon, the person people referred to as “A Pillar of the Court”, the Marquis of Ning, Xie Yu. This man, in days past had been described as handsome as “orchids and jade trees”, was now over 50, but his upright face and elegant features still held the comely looks of his youth. He had retained his figure, neither too skinny nor fat, but was instead vigorous and powerful. He was dressed in a slightly aged domestic dress robe, a jade belt tied at his waist with no other ornaments, but this only accentuated his unignorable grace. Mei Changsu bowed slightly, smiled, and making no further courtesies, slowly took a step back. “Yes father.” The two brothers bowed simultaneously, and retreated from the room along with Mei Changsu. It was not until they were outside the courtyard that they fully relaxed. It was only then that Xiao Jingrui remembered, smiled a little embarrassedly, and led the way. Seeing this, Xie Bi stopped joking around, and the two of them accompanied Mei Changsu to the Snow Cottage together. Since they had received orders earlier, the servants of the Xie Prefecture had already cleaned the Snow Cottage, exchanged its amenities for new ones and prepared warm tea and water. The entire cottage seemed homely, not in the slightest like a guest wing that rarely received visitors for a stay. “Yujin, didn’t we tell you to come over tomorrow? It is late, why did you come at this time in such a hurry?” Xie Bi asked from the side in a cool manner. Hearing him say this, while it was nothing much for Mei Changsu, but for Xiao Jingrui and Xie Bi, they both looked on with rounded eyes and curiosity written all over their faces. Since the two of them knew Yan Yujin very well, they knew that this son of the Guojiu5 loved excitement more than any other; wherever there was a commotion, he was sure to be seen there too. As he had been part of many exciting events, his expectations naturally arose too, so for him to say that it was very exciting, there would be no way that it wasn’t. “Don’t leave us hanging, hurry and tell us, what sort of excitement is there to see? Is the Court holding extra imperial exams or naming new military exam champions?” Xie Bi urged him to continue. “This is pretty interesting,” Xiao Jingrui raised his eyebrows, “The diplomatic emissaries from Da Yu should include The Golden Condor, Chai Ming, and the ones from Northern Yan, even if we don’t know if Tuoba Hao came or not, but they would not be too bad either. The competition between them should be worth a look. “How is it that a competition from two sides, consists of three parties!” Yan Yujin seemed pleased with himself and smiled. “Listening to what you are saying, Da Yu and Northern Yan have come this time, having a particular person they are seeking marriage with? “What else is there to continue on? Just about everything that needs to be said has been said….” The sight of a grown man puffing out his cheeks and whining in complaint, somehow, this actually looked rather cute. A hint of a smile so small that it was almost impossible to detect arose on Mei Changsu’s face. Yes, how could Princess Nihuang marry? She was not an ordinary Princess living in the deep boudoirs of a palace, but a female warrior of rare military genius, a commander in charge of a hundred thousand cavalry, guarding the southern borders. Ten years ago, the country of Chu, a powerful enemy on the southern borders of Da Liang, started a war. The Duke of Yunnan, Mu Shen, who was in charge of guarding the southern border, died in battle. Thus, his daughter, Princess Nihuang, stepped into his place under dire circumstances, and lead the troops, all garbed in mourning dress, to meet the enemy and annihilated thirty thousand Chu calvary outside the Qingmin border pass after a bloody battle. The Court thus issued a decree that Princess Nihuang is to guard the south border in her younger brother’s stead, and to become the commander of the Southern Border Army. The Princess had once vowed that for every day that her younger brother could not bear the heavy burden of becoming the Duke of Yunnan, she would not marry, and so to this day, the twenty-seven year old princess was still single. 2. Screen Wall: Generally, there is a screen-wall inside the entrance to a prefecture so that outsiders cannot see directly into the courtyard. 3. Zhuque Gate: the southern main gate of the Imperial Palace. Zhuque refers to the mythical beast, the Vermillion Bird of the Four Symbols in Chinese mythology. It represents the element of fire, the direction of south and the season of summer. The other beasts include the White Tiger of the West (metal, autumn), the Black Turtle of the North (water, winter) and the Azure Dragon of the East (wood, spring). There is also a fifth beast which is sometimes included, the Yellow Dragon of the Center (earth). 4. Xiansheng: an address for a person you respect, specifically for scholars, it can also be an address for your teacher.